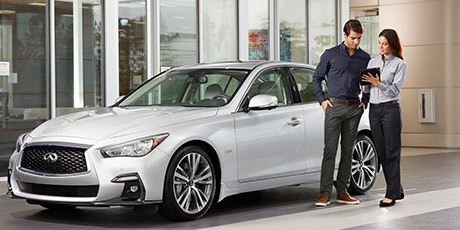 As an INFINITI owner, you’re accustomed to a luxury driving experience that is centered around you. So it should be no surprise that our INFINITI Retailers provide the same level of modern luxury you’ve come to expect. From the moment you arrive, you’ll receive the highest level of personal care. You can also take advantage of a wealth of amenities while your vehicle is being serviced. It’s all part of our goal to maintain the comfort and optimal performance you’ve enjoyed since the first time you drove your INFINITI off the lot. A simple and easy way to help keep your INFINITI running like new is to follow the manufacturer’s recommended maintenance schedule. Even performing minor maintenance services like oil changes or tire rotations can help improve vehicle performance and avoid costly repairs in the future. An INFINITI Retailer is the only place where you’ll find Genuine Parts specifically designed for your vehicle. And with expertly trained technicians, no one knows your INFINITI better than we do. In fact, we have so much confidence in the superior quality of our products that we proudly stand behind them with our parts and labor warranty. So why take it anywhere else?